I have a few more cards to share with you today, they both feature items from the new MFT release. If you haven't had a chance to check out all the new release items yet, you can do so here. This release was full of so many amazing products that I would have a tough time trying to pick out a favourite. This card features a few of the products that I LOVE, the Words of Gratitude Die-namics, Burlap Background, and the Mini Chicken Wire Die-namics. To create the heart I used the Heart STAX Die-namics to die cut Brick Red card stock, and I stamped it with the Burlap Background. I love the look of the burlap stamped in red. 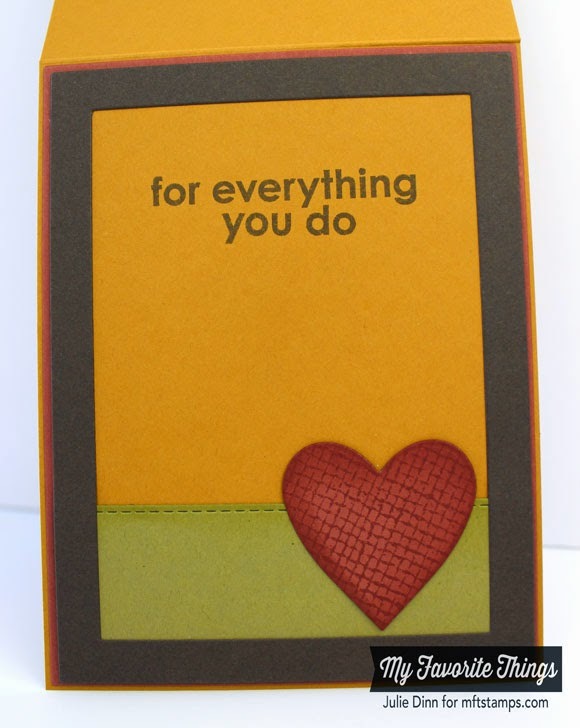 The grateful sentiment was die-cut in Chocolate Brown card stock. The Safety Orange base of the card was stamped with the Mini Chicken Wire Background. On the inside of the card, I stamped a sentiment from the Thankful Thoughts stamp set. My second card features the new Free with $60 set, Many Thanks Die-namics. This set of three dies will be a staple in your die collection. 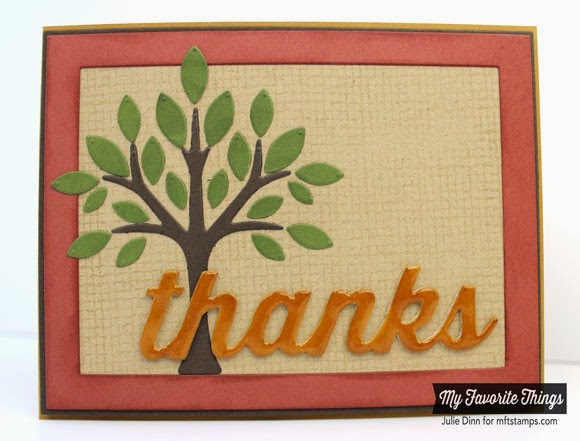 Here I die-cut the thanks in Safety Orange card stock and I sponged it with Safety Orange Hybrid Ink. I then applied a thick layer of Crystal Effects. 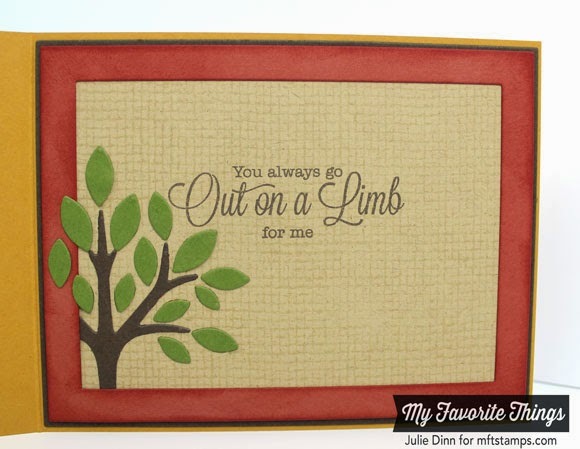 The tree was created with the fabulous Out on a Limb Die-namics. It was die-cut in Chocolate Brown and Jellybean Green card stock. On the inside of the card, I stamped a sentiment from the Out on a Limb stamp set. I couldn't resist using the Burlap Background on this card. The new backgrounds seriously have not left my desk for the last few weeks. Be sure to check out the MFT Blog to see all the gorgeous cards the Design Team has to share with you today. Thank you all so much for joining me this past week. Your comments truly mean so much to me. I can't wait to see what you all create with your new goodies! Fabulous use of these gorgeous Fall colors! I love these! I so need that Out on a Limb die set. LOOOOOOOOVE these Jules! Your first card with that big, fabulous heart is PERFECTION! What an awesome way to feature the sentiment die!!! LOVE your second card with the tree as well!!! AWESOME!!! Really how stinking cute are these.. Omg.. That burlap the heart the colors. All the elements are well done. I'm so sad this is over until Next month, but I'll be back.